The Norton family, of which I am a descendent, came to America from England. In fact, when we were publishing needlework magazines, one of the great historians of needlework Joanne Harvey told me that she had created a needlework kit whereby I could re-create the Hannah Norton sampler from the Historic New England collection. The original was stitched in 1795, and I am sure this is a direct link from me to some Royal family in England—I just haven’t figured it out yet. All that to say I love my English roots. I want my garden to look like an English cottage garden and my blue-and-white china collection to resemble those found in houses in Great Britain. Afternoon tea is a delight for me, and baking scones makes me feel a little more British. The first time I went to England I loved the train rides through the countryside. I felt the same when Neal and I traveled in France. What amazed me the most were the gardens that surround most every house in France. Gorgeous roses graced every yard and covered beautiful fences and walls. When our editorial team told me we were publishing a special edition of Victoria on European Treasures, visions of the verdant landscapes and gorgeous gardens filled my mind and my heart skipped a beat. The verdant Mount Stewart gardens featured on the pages of European Treasures. As with anything, we take bits and pieces of our inspiration and incorporate them into our homes and gardens. 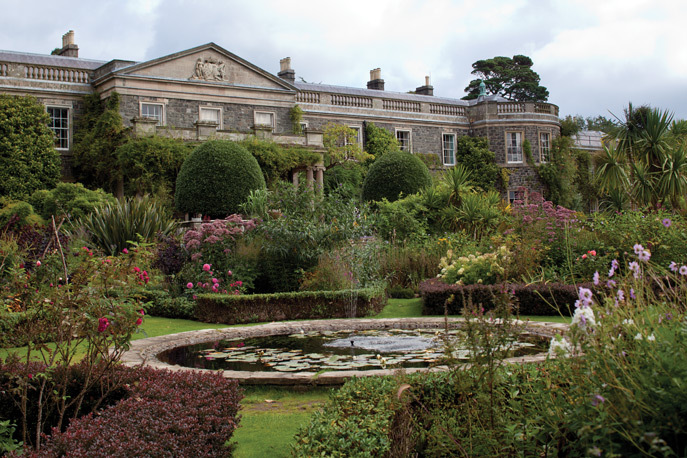 Turning through the pages of their new issue, I found fresh inspiration in the gardens they featured, such as the lush Mount Stewart gardens in Northern Ireland with their many pathways into perfectly cultivated outdoor rooms. 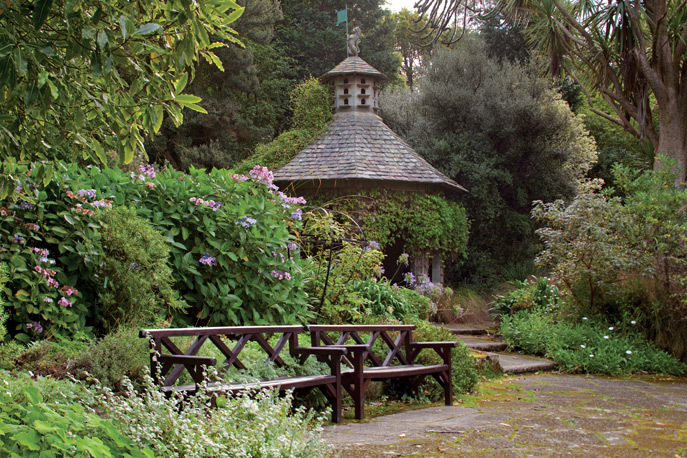 A gazebo tucked among the foliage at Mount Stewart. I also love the incredible collection of different botanicals on display in European Treasures’ feature the Bodnant Garden in Wales. 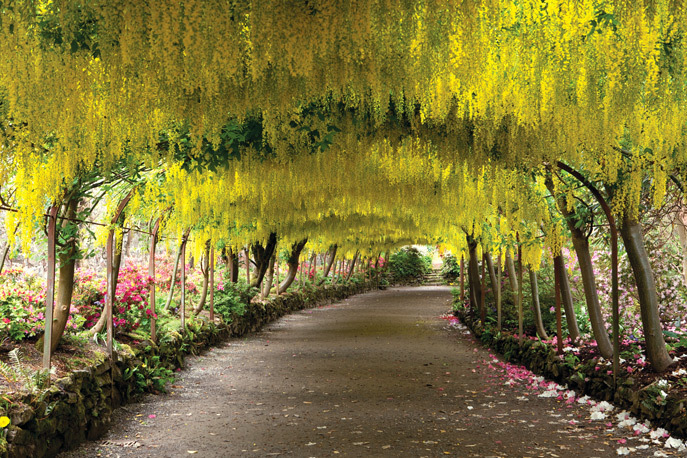 The bright yellow Laburnum Arch captured in its colorful late-May bloom is simply breathtaking. This little preview only skims the surface of all the beauty that spills off the pages of this very special edition. Is there a part of European culture that inspires you? Tell me about it. I loved your special edition on Euro homes; this looks lovely too. What a gorgeous yellow garden photo! 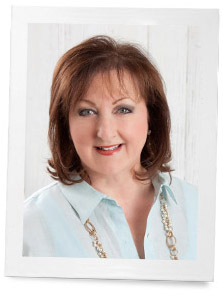 Great article Phyllis, The European look never goes out of style, when we retired and re-located to No. Calif. we did our guest bedroom in black and white décor with Guy Buffet and Monet prints I had in my collection and our guest black four poster bed is adorned with a printed black and white comforter spread with lots of pillows with the center pillow reading “HOTEL DE GUEST.” I have a nice smelling diffuser in the room for atmosphere I open the room throughout the day just to smell the aroma. One wall has a tall bookshelf with a wide selection of books to read. Added some unique accessories to complete the look. Just love your correspondence and all the memories you bring to us. I have been lucky enough to have visited Paris and Italy… Their gardens are vibrant with color but never overpowering… Their simplicity makes their gardens so attractive and makes you want to go home and mimick what they have achieved! They have such a unique touch with their decor as well… I always decorate with a European flair because I have such an attachment to their style, but most of all it is what I feel so comfortable with! I love everything European whether it be their decor, their gardening and their style of dressing… When people ask what my style is in decorating my answer is European!! Like you, Phyllis, I am descended from English heritage with the Dame Family roots traced as far as the time of the Norman Conquest. Is that why I enjoy tea? Maybe. And crumpets, not scones which come from Scotland, really. Also like you, I love blue and white anything, with creamy yellows and sea greens. “Blue Willow” is, of course, our dinner ware for dining room, kitchen table, or for al fresco on the courtyard surrounded by Old English roses. I saw Monet’s garden in April and it was breathtaking with the Spring colors. My garden looked bleak in comparison! This past April we travelled to Vienna. There are so many wonderful parks and gardens everywhere. I was wowed by the gardens at the Belvedere Palace and the Schonbrunn Palace. They were simple, yet stunning. Phyllis, this issue is on my “get it now!” List. As a European antique dealer, I love European treasure so much that I turned that love into my business. What I love most about my European heritage is the beautiful way of doing every day things, the celebration of everyday moments and traditions. Having a beautiful cup filled with tea every afternoon at 3:30, always having fresh flowers in an antique vase in the living room, living in an orderly home. These are all things that I admire and strive to have. Then there are the gardens, the charm, and the overall care with which our European friends and families live out their days, taking care to put people first. Really looking forward to this gorgeous issue! Provence, Paris and the Riviera inspire me. My French Canadian family came from France, and I’ve always wanted to visit and explore it. I can’t wait to see the upcoming Victoria issue!